The Cats were run close in the opening 35 against Limerick but a glut of goals saw them through to the final four. Cody oversaw a Kilkenny team that upped the ante after half-time. THE WEIGHT OF goals delivered by Henry Shefflin and his attacking colleagues eventually buried Limerick after a close contest in the first half. The Cats emerged from their quarter-final encounter by a scoreline of 4-16 to 1-16 and will now face Tipperary in the last four on 19 August. The much-anticipated contest will be Kilkenny’s 16th successive semi-final. 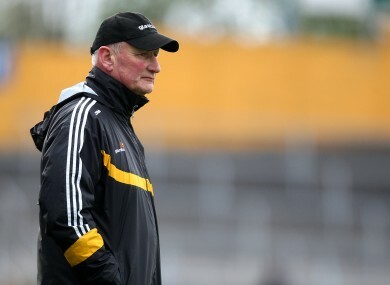 Manager Brian Cody paid tribute to Shefflin for keeping his side ticking over in the first half and has now set his sights on a knockout game against the side they defeated in the All-Ireland final last year. We were struggling a bit and were lucky to be a point up at half-time. We picked it up a bit in the second half. The prize was to get get an All-Ireland semi-final and we have achieved that. The veteran manager denied that there was any added pressure on Kilkenny following their Leinster Final defeat to Galway two weeks ago. “We were aware of the challenge that Limerick would bring and they brought every bit of it,” said Cody. In fairness, Henry did a large amount of scoring for us in the first half. It is a testament to the man he is. Ever the master of understatement, Cody remarked that many of the Kilkenny panel were ‘looking forward’ to their August date with Tipperary. Email “Cody praises King Henry as Kilkenny book semi-final date with Tipperary”. Feedback on “Cody praises King Henry as Kilkenny book semi-final date with Tipperary”.